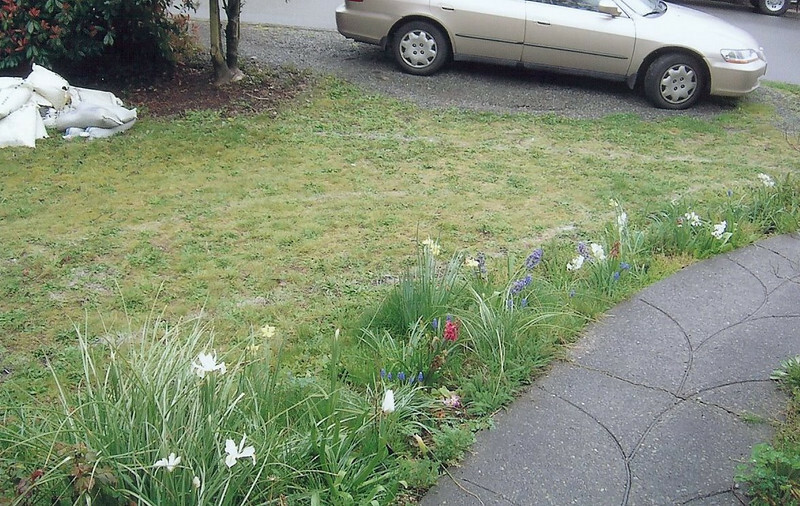 Front yard before RR and after RR. Sadly, I have no photos of the actual construction of the beds, hardscape or track. This is pre-digital for me, so I was still mindful of how many photos I was taking with film. These were dredged out of a photo album and scanned. This was executed in less than two months, I believe: May to July. The only plan I had and still have for this railroad is to run the trains. That means laying track quickly and getting underway. No complicated track plans, construction methods or operating paradigms. I sometimes call it the Q&D RR: Quick and Dirty Railroad. This has served me well. Two shots of the front yard just as I was getting started. The plan was all in my head, no sketches or other drawings.